2018 Ford Fiesta's Smart Features "Outthink" Accidents Several Steps Ahead | Donley Ford Lincoln of Mt. Vernon Inc.
Just how smart is the 2018 Ford Fiesta? We like to think of it as the subcompact class valedictorian. MyKey customization lets you negate any other operator’s impulsive or distracted driving personally. Even when someone else is in the driver’s seat, your settings dictate the audio system volume, whether the Belt-Minder warning chime rings until each occupant buckles up and even the vehicle’s top speed. If MyKey serves as a watchful eye on whoever happens to be behind the wheel, our standard rear-view camera literally has your vehicle’s backside covered. Once you shift into Reverse and start backing up, the system automatically sends a crystal-clear image to the center stack’s display screen. 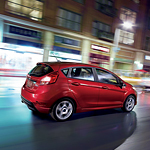 ?Take a 2018 Ford Fiesta for a test drive today at Donley Ford Lincoln of Mt. Vernon Inc., and get acquainted with a subcompact are smart enough to stay several steps ahead of any accident that might land you and your family in harm’s way.